On the one hand, it’s nice to see Shirley MacLaine headlining a film again in this day and age, after years of supporting roles and being in some films that never even made it to a wide theatrical release. On the other hand, the film in question is The Last Word, which despite the Hollywood legend’s best efforts can’t escape the fact that she is playing an absolute monster of a human being, and what’s worse is the fact that they are asking us to sympathise with her. MacLaine is Harriett Lauler, a retired businesswoman with a serious control problem, in that if anything is not done to her exact words and demands then she just takes over and does it herself. After a brief stroke with death, she decides that when the time does come she wants to be prepared as ever, so she enlists young journalist Anne (Amanda Seyfried) to write her obituary with as many compliments from previous associates as possible… which ends up backfiring because everyone she knows has nothing but awful things to say about her, and for good reason: she’s an absolutely horrible person, endlessly snobbish with a permanent look of disapproval on her face, yelling and screaming at people who dare question her motivations, and grossly self-centred and condescending to everyone that isn’t herself. But as movie logic dictates, she has a secret charm that wins over Anne, against her (and our) better judgement, and the two end up bonding in all sorts of unexpected and contrived ways. However, by the time that we are supposed to be 100% on her side, she has already done and said so many things that have made her virtually irredeemable in our eyes, so to ask us to suddenly root for her is one giant ask too many, because for most of the film she is an insufferable wench who really needs to be put in her place but somehow never actually is. MacLaine is actually very good in this, but that makes the hatred one has for this character even greater because it comes across as a lot more genuine and believable than it would with a much lesser actress in this part; ironically, by delivering a rather strong performance Shirley MacLaine has made it even easier to hate this person. As for everyone else, they’re struggling to keep up with MacLaine’s shadow; Seyfried is just kind of there, mostly just saddled with not much in terms of interesting character development, and then there’s sassy foul-mouthed black kid (because of course this movie has one of those) who contributes almost nothing except to be an unnecessary and annoying third-wheel in what should really be a two-woman vehicle. Horrific lead character aside, I had some serious issues with parts of the filmmaking, which were some of the most bafflingly incompetent examples I have seen in a cinema in years. In scenes of dialogue whenever it cuts to and from several close-ups, you can clearly hear the background noise from each differing take cut in and out, which represents the kind of awful editing you don’t often see in major theatrical releases like this. At first, I wasn’t sure if this was just the audio system of the screen I saw this in playing up, but that’s really telling when you’re not sure if it’s the screen’s fault or if the movie is that poor in the sound editing department you can pick up those kind of mistakes as easily as you can; either way, it’s extremely distracting, and it takes you out of the movie far often than you could imagine. There’s really not a whole lot else to say about The Last Word, except for everything that has already been mentioned, from its horrifically unlikeable lead protagonist to some of the worst sound editing I’ve seen in a cinematic release in years, because there’s honestly not much else to say about it. It’s just one of those films that nobody will remember a few months from now, maybe weeks or even days, because aside from those two glaring issues it really is that forgettable. 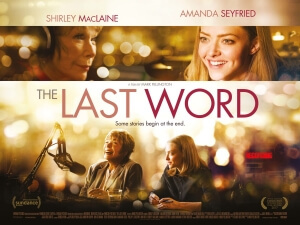 The Last Word is an utterly forgettable movie with almost nothing worth recommending or even mentioning, except for some of the worst and most distracting sound editing you’ll probably hear in a theatrical release all year, and a horrific and disgustingly unlikeable lead character who, despite Shirley MacLaine delivering a very good performance, is so irredeemable by the time it asks you to sympathise with her that it’s almost laughable that they’ve asked you to display any kind of sympathy for her whatsoever.